As many of you might already know, God of War designer David Jaffe has quit making story-driven games, and for better or worse, stuff like Calling All Cars! is what he intends to create from now on. It's simple, lighthearted and - dare we say it? - casual, so if you're expecting an earth-shattering experience on par with Jaffe's earlier efforts, don't. But for the price, this download from the PlayStation Store isn't a bad way to kill a couple hours with some friends. Playing like a mashup of Twisted Metal, Micro Machines and an old Keystone Kops short, Calling All Cars! tosses players into four-player funny-car skirmishes to run down Depression-era convicts and drive them back to the pokey. The criminals only escape one at a time, but finding them is easy. Hanging onto them, though, that's another story - your competitors will constantly try to knock your captive out of your car and into theirs, turning the game into a vicious free-for-all as you race to make it to the jail with the crook intact. There are two ways to knock a criminal out of a competitors' car, the first and easiest being to just slam on the nitrous and ram whoever's holding the prize, at which point the bad guy will fly directly into your passenger seat. But watch out - there's always a temptation to turbo the hell out of there once the crook's in your clutches, and if you hit someone while you're boosting, your hostage will bounce straight into their car. If someone's gunning for you, though, you do have one defense - your car can hop, and if you do it at just the right time, they'll roar harmlessly past you. 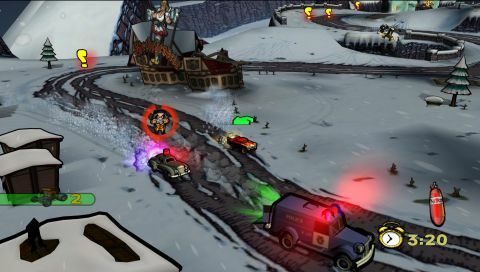 Description A side project from the creator of God of War, David Jaffe, the four-player runabout has more in common with his early Twisted Metal games.